Tears are made in a gland under the skin above the eye. They flow over the front surface of the eye, and drain into tiny tear ducts in the eyelids, near the nose (under the skin). 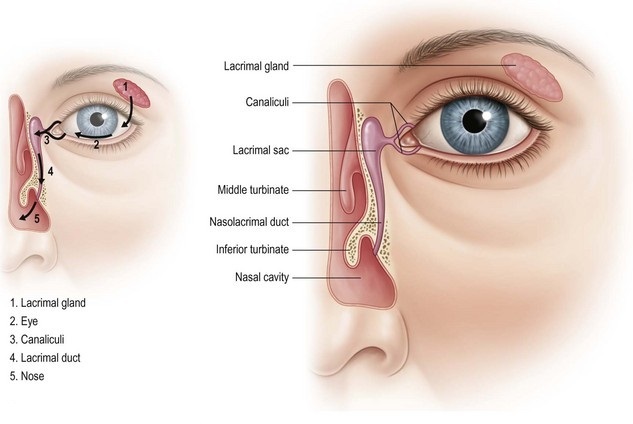 Then they flow into a tear sac and from there they pass through a wide channel into the inside of the nose. If the tear passages near the nose block off, you may notice a watery eye or infections of the tear sac. 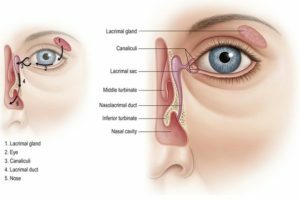 The tear duct apparatus may block at any point along the tear passage, but the most common place for a blockage is just below the tear sac. The cause of this blockage is not usually known. The treatment that the doctor will recommend depends on how much discomfort there is. A blockage at the entrance to the tear duct may develop. The entrance can be widened with a very small operation. A saggy or lax lower eyelid may develop. This can be corrected with a small operation in the outpatient department. Less common causes of blocked tear ducts include conditions inside the nose, such as polyps. Too many tears. There are some conditions that can cause your eye to make too many tears. Dry eyes. Suprisingly, if your eyes are 'dry' you may notice watery eyes. Because the tears are too thin, and do not spread evenly across the eye, dry patches may develop on the surface of the eye. The dry patches make the eye feel sore and then your eyes start to water. The solution is to use an artificial tear that lubricates the eye better. In-growing eyelashes or anything that irritates the eye. In growing lashes need to be removed, although they may grow in again. Grit or sand under the eyelid cause too many tears.